Scheduled pickup by city crews are conducted in the spring and fall each year at no charge. Leaves must be placed in the parkway in clear garbage bags in the spring during the published dates (mid April) along with brush laid along side it tied in bundles. Loose leaves will not be collected in the spring due to the presence of grit and gravel materials on the parkways following the winter months. In the Fall (October / November) the city requires leaves to be piled loose on your roadway parkway since the leaf loading vacuum machine is used. These pickups are intended for the disposal of leaves, limbs and branches that are generated by the property owner for normal yard maintenance and upkeep. This service is NOT INTENDED FOR TREE REMOVAL, LOT CLEARING OR THE REMOVAL OF BUSHES whether performed by the contractor or property owner. City crews will not collect any materials produced by private contractors or trees cut down by property owners. Leaves and brush shall not be deposited on the street or roadway. Leaves shall be in clear garbage bags, not to exceed 35 pounds & tied. Brush shall be tied in bundles with twine (Do Not Use Wire). Limbs and branches shall not exceed 3 inches in diameter and shall not be longer than 5 feet. ABSOLUTELY NO GARBAGE, APPLIANCES, FURNITURE, TIRES, ETC. No attached or unattached tree stumps or tree root systems will be collected. Any item not in compliance will not be collected by the City and will be left on the terrace area for the resident to remove. Please have your leaves on the curb or edge of yard on or before the Monday morning of your respective week. Crews will begin early in the morning creating some noise. 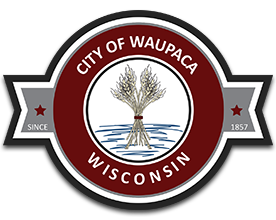 To learn which ward you are in, visit our website at www.cityofwaupaca.org. Friday 7:00 a.m.- 4:00 p.m.
Saturday 7:00 a.m. – 5:00 p.m.